Gastric sleeve side effects can happen after surgery. Fortunately, Gastric Sleeve Surgery (known as Vertical Sleeve Gastrectomy) is a weight loss surgery procedure that typically is easier to manage and maintain while being less-invasive than gastric bypass. However, there are potential gastric sleeve side effects that can be uncomfortable. Compared to other bariatric surgeries, the gastric sleeve is currently the most popular procedure with the least amount of side effects and complications. Every day we typically lose 75 to 100 hairs. However, some patients will lose hair during rapid weight loss (sometimes in clumps that may be alarming, but is purely hormonal). Once you are getting near your weight goal, hair loss will slow down. Hair loss may or may not happen to all gastric sleeve patients, but it usually isn’t something to worry about unless your physician is concerned about malnutrition. Typically the hair will regrow once you’ve reached your weight loss goal. If you’re worried about hair loss, you can take hair supplements to help combat the rate at which you lose hair. Diarrhea and loose stools can be frequent and very familiar with gastric sleeve surgery. This can occur several months following surgery. Because the first part of the postoperative diet is mainly liquids, many patients will have loose stools and frequent bathroom usage. However, this should only be a temporary issue though as the patient progresses to more and more solid foods – patients should see this issue will diminish. If you have constipation, drink more liquids. If you continue to have a problem with constipation, you may use daily medications such as Kaopectate® (for diarrhea) or Dulcolax® Tablets (for constipation). Speak with your primary care physician before taking any medication. Nausea may occur after surgery and can be treated with medication (ask your physician). For a natural remedy, try the decaffeinated green tea. Nausea is often the result of the patient eating too fast, drinking liquids while eating, not chewing foods enough or eating more than you should. Ultimately, nausea should subside as the patient becomes acclimated to their new eating habits and how much food it takes them to get full now. To combat nausea, patients must consume foods and drinks slowly and thoroughly. Also, never drink while consuming a meal because it results in the patient getting full of liquids instead of nutritious food that will give them energy and promote weight loss. Vomiting may occur because of trying new foods or nausea. If vomiting occurs, it’s important to go back to a fluids-only diet for up to 1 day until trying solid foods again and keeping them down. If vomiting is consistent and unavoidable, it could be a sign of a serious issue. Contact your physician immediately. One of the most common questions we receive is whether the stomach will stretch after gastric sleeve surgery? Learn more about stomach stretching after gastric sleeve surgery. Perhaps one of the most dangerous side effects is esophagus stretching or dilation. These can occur because of excessive vomiting, binge eating or a stomach obstruction. A stomach obstruction happens when from food or swelling internally. Bleeding, organ injury, and even infection are all potential complications after gastric sleeve surgery. 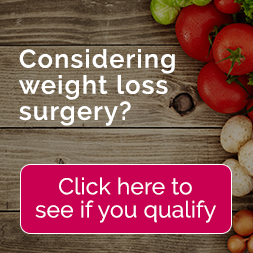 Ultimately, it’s important to understand fully all of the complications and risks before deciding on any bariatric surgery. Contact our helpful staff to see if gastric sleeve surgery is the right weight loss surgery for you.